CARIBOU — Bicycles and new board members highlighted Northern Maine Development Commission’s annual meeting, held Thursday, June 21 at the Caribou Inn and Convention Center. Member representatives elected Dave Cyr, Mars Hill Town Manager, as Chairperson; Gary Picard, Town Manager of Madawaska, as Vice-Chair; Nancy Troeger, Van Buren Town Manager, as Treasurer; and Dave Dionne, Mapleton Town Manager, as Secretary. New Executive Board members approved include: Mitch Butler of Fort Fairfield, Beverly Fournier of Winterville, Reed Plantation Town Manager Diane Hines, St. Agatha Town Manager Aubrie Michaud, Tom Pelletier of Fort Kent; Washburn Town Manager Donna Turner, Michael Tweedie of Blaine and Wallagrass Town Manager Lana Voisine. Also, at the meeting two NMDC employees were recognized for their commitment to the organization. Dave Spooner of the Business Finance Division was lauded for his 20 years at NMDC and Joella Theriault of the Planning and Development Division for 25 years. The meeting concluded with a presentation by MaryBeth Luce of the Bicycle Coalition of Maine. She detailed the many programs and initiatives of the coalition, but the crux of her talk focused on the upcoming BikeMaine ride to be held in Aroostook County in September. Luce is the BikeMaine ride director and has spent a considerable amount of time in the region in preparation for the event, which will bring 450 riders and dozens of support staff to Central Aroostook and the St. John Valley from Sept. 9 to Sept. 15. In 2017, the BikeMaine ride downstate brought in $660,000 of direct economic benefits to its host communities in Somerset County. In the past five years, it has contributed $2.3 million to the state’s economy. Presque Isle, Caribou, Madawaska, Fort Kent and St. Agatha all will serve as host communities for the cyclists during the trip, which organizers call “BikeMaine 2018: Acadia in the St. John Valley — La Terre Entre Deux.” In each town, staff members and volunteers will set up outside “tent villages” for the cyclists and provide food from local farmers and businesses as well as entertainment. 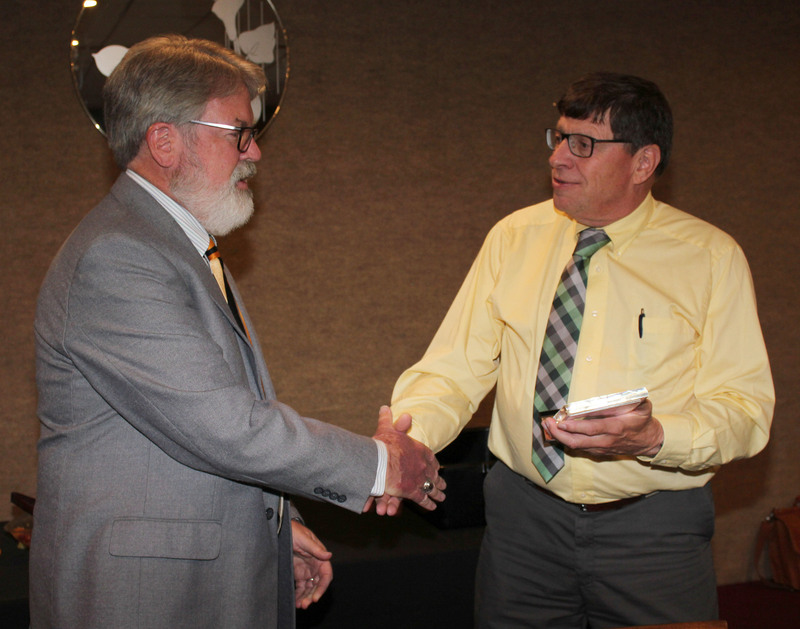 Photo caption: New NMDC Executive Board Chairperson Dave Cyr, right, presents outgoing chair, Jim Risner, with a plaque thanking him for his service. AROOSTOOK COUNTY — When some people think of tourism season in Aroostook County, snowmobiles immediately come to mind, or an earlier October trip to see the changing foliage, but summer is a growing tourism season for Northern Maine thanks to many festivals, abundant non-crowded bodies of water and hundreds of miles of ATV trails. Whereas a lot of the communities hold festivals, which feature a multitude of events, from concerts to barbecues to road races, other events are more activity specific. If you want to look skyward for your entertainment there is the Crown of Maine Balloon Festival in Presque Isle. For motorsports folks, ATV opportunities abound in the summer and fall in Aroostook County. And for those not up for a festival or ATV ride, with the vast number of ponds, lakes, rivers and streams in northern Maine, there are no shortage of public boat launches to enjoy. Whether you have a paddle or twin outboards pushing you along the water, there is a body of water just waiting for you in Northern Maine. 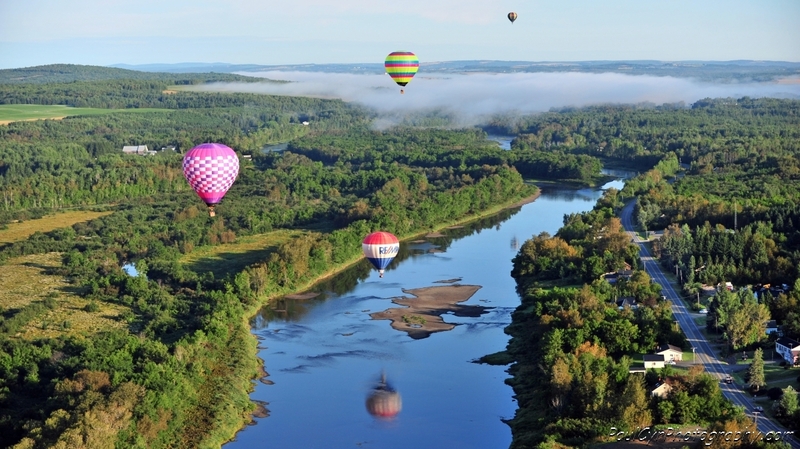 To learn more about events, activities and more, log onto www.visitaroostook.com. CARIBOU — Work is underway to federally designate a bicycle route connecting Bangor to Fort Kent. A route which should provide significant economic, transportation, environmental and health benefits to residents and visitors to Northern Penobscot and Aroostook counties. Northern Maine Development Commission (NMDC), in conjunction with the Maine Department of Transportation (MaineDOT), started the project to achieve the bike route designation. The new bicycle route would complement and connect to the existing US Route One Bike Route, which runs from Florida to Calais, Maine. Jay Kamm, Senior Planner at NMDC, said the proposed route would be located on existing state and local roads and/or existing bike and pedestrian trails in the region. It is envisioned that the route will connect to the existing US Bicycle Route in Bangor and terminate at the international bridge in Fort Kent. The draft proposed route is approximately 320 miles and the application to the federal government is due in the fall of 2018. The Northern Maine US Bike Route will be part of the United States Bicycle Route System (USBRS), which is the national cycling route network of the United States. It will be part of the interstate long-distance cycling routes and will utilize multiple types of bicycling infrastructure, including existing off-road trails, bicycle lanes, and low-traffic roads. The Northern Maine US Bike Route is intended to traverse the two counties and connects to previously designated scenic byways, Katahdin Woods and Waters and St. John Valley Scenic Byways, and the Katahdin Woods and Waters National Monument. The route will begin/terminate at the international border crossing in Fort Kent, designated as America’s First Mile of US Route One. “The Route will also highlight the region’s cultural resources including, but not limited to, the Swedish Colony, Amish communities, Acadian heritage, the University System, and highlight the importance of agriculture and forestry to the regional economy,” added Kamm. The route will be shown on national maps and be identified as a bicycle tourism destination. Designating a USBR creates intrastate connections to coastal Maine as well as possibilities for cross-country travel by bike, bringing out-of-state tourism spending and generating interest in northern Maine. For more information on the project or to participate, contact Kamm at jkamm@nmdc.org or by phone at (207) 493-5757. NMDC's Business Finance Division now has a new tool to help clients. 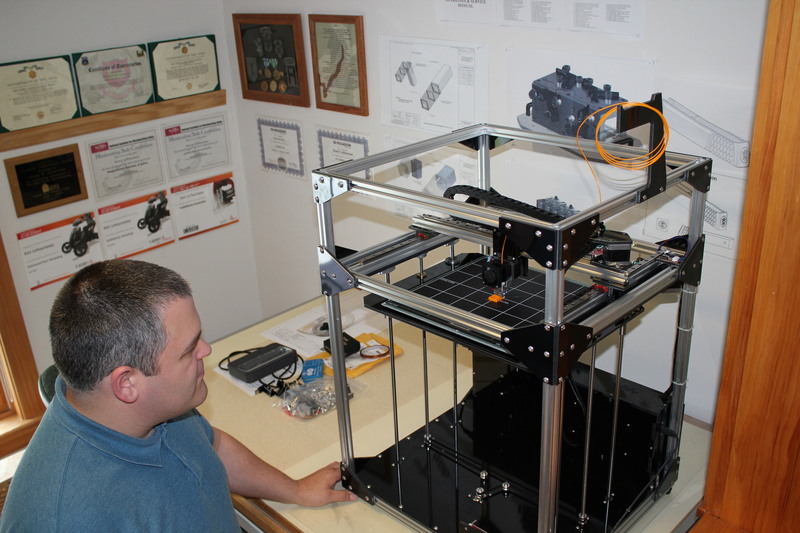 Business Counselor Ken LeTourneau demonstrates 3D printing capabilities at NMDC. Maine PTAC is part of a nationwide network of Procurement Technical Assistance Centers, or PTACs. We work with Maine-based companies that are interested in selling their products and/or services to local, state or federal government agencies, either as prime contractors or subcontractors. NMDC’s experienced PTAC Procurement Counselor provides a wide range of counseling services to assist local businesses market to government agencies and government prime contractors. This program is funded through the U.S. Defense Logistics Agency, the Maine Department of Economic and Community Development and support services at NMDC, through a contract with Eastern Maine Development Corporation. Recorded $17,071,623 in awarded contracts to area NMDC/PTAC clients. When we discuss ‘government contracting’, most businesses think of the federal government, but the opportunities are wide and varied for State of Maine and local municipality and county contracts. The State of Maine alone buys a wide variety of commodities and services, both in large and small quantities. More than $144 million in commodities and $800 million in services. We have assisted area small businesses in selling hats, shirts, snowmobiles, landscaping services, printing services, cleaning services and more. And believe it or not, it is relatively easy to do business with the State of Maine and even easier with local government entities. Maine PTAC is here to assist your local businesses with researching and submitting bids for current solicitations of goods and services at no fee to the business client. For more information, contact Dana Delano at ddelano@nmdc.org or by phone at 498-5026. AROOSTOOK COUNTY — Northern Maine Development Commission (NMDC)is about to undertake an Americans With Disabilities Curb Ramp inventory for the Maine Department of Transportation (MaineDOT). NMDC will be inventorying state-owned curb ramps (crosswalks) for compliance with the ADA Law. With the information obtained, MaineDOT will examine their compliance with ADA, determine if the ramps are impacting access to public facilities, and prioritize the needs for their pedestrian infrastructure. ADA law requires that an inventory of pedestrian infrastructure be completed and a list of compliant and deficient ramps be maintained. From this inventory, MaineDOT will prioritize projects based on access, use, and proximity to public facilities. NMDC will be completing data collection throughout the summer. Inventories will only be conducted along roads maintained by MaineDOT using GPS and data collectors. According to MaineDOT, there are thousands of curb ramps located throughout the state and most are not 100 percent compliant. NMDC will be collecting data on both mid-block and at intersections. Our priorities will be the service center communities located in the region and will begin in Caribou. As time and funds are available, additional communities will be inventoried. Staff will be looking at a number of criteria including curb ramp slope, curb ramp width, cross slope, level landing, flared sides, access to a public facility, and if curb ramps are even present. NMDC will contact the individual town office once an inventory begins to inform them that we are collecting data. For more information, contact Jay Kamm at jkamm@nmdc.org or by phone at 493-5757.